In March, President Hackney nominated and the Trustees elected Virginia B. Clark to the senior administrative position of Vice President for Development and Alumni Relations, effective 1 July 1993. She was the first woman to serve the University as Vice President for Development and Alumni Relations and the eighth woman to serve as a Statutory Officer of the University. Ms. Clark had been Associate Vice President for Development since July 1992 and had previously held a series of increasingly responsible positions in the Wharton School, culminating in the senior administrative position of Associate Dean for External Relations. Ms. Clark continues to serve the University as Vice President for Development and Alumni Relations at the present time. Also in March, President Hackney nominated and the Trustees elected Janet S. Hale, B.A., M.P.A., to the senior administrative position of Executive Vice President, effective immediately. She was the second woman to serve the University as Executive Vice President and the ninth woman to serve as a Statutory Officer of the University. 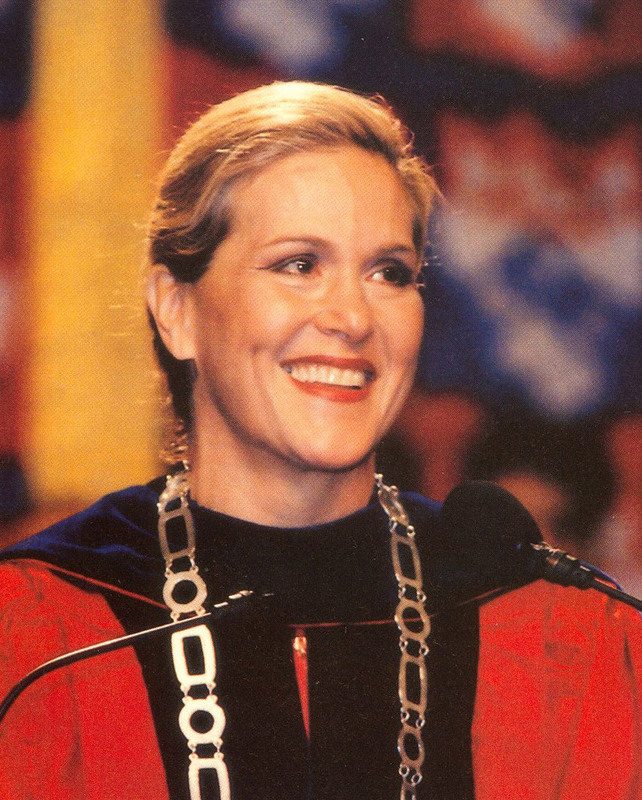 Prior to accepting her appointment at Penn, she was Associate Director for Economics and Government in the Office of Management and Budget in Washington, D.C. She served as Executive Vice President at Penn only until August 1994. She later returned to Washington, D.C. and was appointed Associate Administrator for Finance for the U.S. House of Representatives. In May 2001, President George W. Bush nominated Janet Hale as the Assistant Secretary for Management and Budget in the U.S. Department of Health and Human Services. Her nomination is pending at the present time. In April, the Trustees appointed Claire Muriel Mintzer Fagin, R.N., Ph.D., FAAN (Hon. LL.D., 1994), Dean Emerita and Leadership Professor in the School of Nursing, to a one-year term as Interim President and Chief Executive of the University of Pennsylvania. She was the first woman to serve as chief executive of the University. She served as Interim President from July 1993 until July 1994. She continues affiliated with the University at the present time as Professor Emeritus in the School of Nursing. In May, the Trustees formed a Consultative Committee to invite and review applications and nominations for President of the University. The Committee was composed of nineteen members, including three women Trustees, Susan Williams Catherwood, Gloria Twine Chisum, and Norma Peden Killebrew; two women members of the senior standing faculty, Drew Gilpin Faust, Annenberg Professor of History, and Barbara J. Lowery, Professor of Nursing; and three women students, Jun Suk Bang, Class of 1994 in the College; Susan Laura Garfinkel, a graduate student in the School of Arts and Sciences; and Sharon Allegra Molinoff, Class of 1994 in the Wharton School. Trustees Catherwood and Killebrew, Professors Faust and Lowery, and students Bang, Garfinkel, and Molinoff were the fifth, sixth, seventh, eighth, ninth, tenth, and eleventh women to serve the University as members of a presidential search committee. In May, the University appointed Nancy H. Hornberger, B.A., M.A., B.Ed., Ph.D., to the senior academic administrator position of Acting Dean of the Graduate School of Education. She was the first woman to be appointed Acting Dean of this School and the twelfth woman to serve as an academic Dean at Penn. Prior to accepting this appointment, she was Associate Professor of Education in the Graduate School of Education and Director of the School’s Graduate Programs in Educational Linguistics, Intercultural Communication, and the Teaching of English to Speakers of Other Languages. She served as Acting Dean for two years, until the appointment of a permanent successor became effective in July 1995. She continues to serve the University at the present time as Goldie Anna Professor in the Language in Education Division and Director of the Educational Linguistics Program of the Graduate School of Education. In December, the Trustees elected Judith Seitz Rodin (A.B., 1966), M.A., Ph.D., Provost of Yale University, the seventh President and Chief Executive of the University of Pennsylvania. She is the first alumna to serve as President of Penn and the first woman to serve as President of an Ivy League institution. She was the tenth woman to serve as a Statutory Officer of the University. The Board of Trustees that elected Dr. Rodin to the presidency included fourteen women: Judith Roth Berkowitz (A.B., 1964), Term Trustee; Susan Williams Catherwood, Charter Trustee and Vice Chairman; Gloria Twine Chisum, B.S., M.S. (Ph.D. in Psychology, 1960; Hon. LL.D., 1994), Charter Trustee and Vice Chairman; Carol Blum Einiger (A.B., 1970), Term Trustee; Elsie Sterling Howard (A.B., 1968), Alumni Trustee; Norma Joan Peden Killebrew (A.B., 1961), Alumni Trustee; Natalie Iris Salkind Koether (A.B., 1961; LL.B., 1965), Term Trustee; Andrea Louise Mitchell (A.B., 1967), Alumni Trustee; Vivian Weyerhaeuser Piasecki, Term Trustee; Adele Kaplan Schaeffer (A.B., 1955), Term Trustee; Sandra Ann DiGioia Williamson (A.B., 1963), Alumni Trustee. In addition, three women were Emeritae Trustees: Leonore Annenberg (Hon. LL.D. 1985); Margaret Redfield Mainwaring (B.S. in Ed., 1947; Hon. LL.D. 1985); and Jacqueline Grennan Wexler (Hon. LL.D. 1979). In September, President Rodin nominated and the Trustees elected Carol Ruth Scheman, B.A., M.A., to the senior administrative position of Vice President for Government and Community Relations, effective 15 September 1994. Prior to accepting her appointment at Penn, she was Deputy Commissioner for External Affairs at the U.S. Food and Drug Administration in Washington, D.C. She was the first woman to serve the University as Vice President for Government and Community Relations and the eleventh woman to serve as a Statutory Officer of the University. She continues to serve the University as Vice President for Government, Community, and Public Affairs at the present time. In October, the General Alumni Society elected Mary Ann Baker Greenawalt (A.B., 1962), President of B & B Specialty Foods, and Marjorie May Osterlund Rendell (A.B., 1969), then a Judge of the U.S. District Court for the Eastern District of Pennsylvania, to five-year terms as Alumni Trustees. Their terms began in January 1995 and concluded in December 1999. They were the fourteenth and fifteenth women to be elected Alumni Trustees. Mary Ann Greenawalt was President of the Class of 1962, a Director of the Detroit Alumni Club, and the recipient of the Alumni Award of Merit in 1992. Marjorie Osterlund Rendell had been a partner in the Philadelphia law firm of Duane, Morris & Heckscher prior to her appointment to the Federal bench. In October 1999, at the end of their terms, the Trustees took two actions. They adopted a “Resolution of Appreciation” in honor of Mary Ann Greenawalt, commending her service on the Facilities and Campus Planning Committee and the Development, Student Life, and University Responsibility Committee of the Trustees, as well as for her service as a member of the Agenda for Excellence Council, as a member of the Board of Overseers for the School of Social Work, and as a member of the Trustees’ Council of Penn Women. The Trustees also elected Judge Rendell to a five-year term as a Term Trustee. She was the eighteenth woman to be elected a Term Trustee. She continues to serve the University as a Term Trustee at the present time. In January, Lynda Anne Barness (M.A., 1972), President of the Barness Organization, joined the Trustees as a Commonwealth Trustee. She was the first woman to serve the University as a Commonwealth Trustee and continues as a Commonwealth Trustee at the present time. In January, the University appointed Susan H. Fuhrman, B.A., M.A., Ph.D., to the senior academic administrator position of Dean of the Graduate School of Education, effective 1 July. She was the first woman to be appointed Dean of this School and the thirteenth woman to serve as an academic Dean at Penn. Prior to accepting her appointment at Penn, she was Professor of Education Policy in the Eagleton Institute of Politics at Rutgers University and Chair of the Institute’s Consortium for Policy Research in Education. She continues to serve the University at the present time as Dean and George and Diane Weiss Professor of Education in the Educational Leadership Division of the Graduate School of Education. In October, the General Alumni Society elected Pamela Prudence Petre Reis (A.B., 1970), of Rolling Hills, California, to a five-year term as an Alumni Trustee. Her term began in January 1997 and will conclude in December 2001. She was the sixteenth woman to serve as an Alumni Trustee and continues to serve the University as an Alumni Trustee at the present time. In January, the Trustees elected Carolyn Ann Hoff Lynch (B.S. in P.T., 1968), President of The Lynch Foundation, to a five-year term as a Term Trustee. She was the sixteenth woman to be elected a Term Trustee and she continues to serve the University as a Term Trustee at the present time. In June, the Trustees elected Barbara Jean Wertman Lowery, R.N., B.S.N., (M.S.N., 1968), Ed.D., to the senior administrative position of Interim Secretary of the University. She was the fifth woman to serve as Secretary of the University and the twelfth woman to serve as a Statutory Officer of the University. Prior to accepting this appointment, Professor Lowery was both a member of the senior standing faculty in the School of Nursing, holding the named professorship of Independence Foundation Professor of Nursing and a senior academic administrator, holding the position of Associate Provost of the University. She had also previously served the University as Ombudsman (1984-86) and as Chair of the Faculty Senate (1994-95). In 1979 she was the recipient of the Lindback Award for Distinguished Teaching. She served as Interim Secretary of the University for nine months, until March 1998. She continues to serve the University at the present time as Associate Provost and Independence Foundation Professor of Nursing. In September, the Trustees elected Kathryn Joanne Engebretson, B.A., M.S. (M.B.A., 1983; Ph.D., 1996), to the senior administrative position of Vice President for Finance. She was the second woman to serve the University as Vice President for Finance and the thirteenth woman to serve as a Statutory Officer of the University. Prior to accepting her appointment at Penn, Dr. Engebretson held the position of Principal in the investment banking firm of Miller Anderson & Sherrerd in West Conshohocken, Pennsylvania. From 1992 to 1994, she had held the position of City Treasurer of Philadelphia. Dr. Engebretson served the University as Vice President for Finance for twenty-eight months, until December 1999. She left Penn to accept the position of Chief Financial Officer of BET.com, an internet start-up venture aimed at attracting African Americans to the internet. In November, the Trustees elected Madlyn Gay Kornberg Abramson (B.S. in Ed., 1957; M.S. in Ed., 1960), of Philadelphia, Pennsylvania and Jupiter, Florida, to a five-year term as a Term Trustee. She was the seventeenth woman to be elected a Term Trustee and she continues to serve the University as a Term Trustee at the present time. In February, the Trustees elected Rosemary McManus, B.A., M.B.A., to the senior administrative position of Secretary of the University, effective 16 March. Prior to accepting this appointment, Ms. McManus was Vice President for Housing Impact at Fannie Mae, the Congressionally-chartered, shareholder-owned company that is the nation’s largest source of funds for home mortgages. She was the sixth woman to serve as Secretary of the University and the fourteenth woman to serve as a Statutory Officer of the University. She served as Secretary of the University for two and one-half years before submitting her resignation, effective September 2000. In June, Provost Robert Barchi announced the appointment of Neville Earl Strumpf, R.N., B.S.N., M.S.N., Ph.D., FAAN, to the senior academic administrator position of Interim Dean of the School of Nursing, effective 1 September. Prior to accepting this appointment, she was Edith Clemmer Steinbright Professor in Gerontology and Director of the Center for Gerontologic Nursing Science in the School of Nursing. She continues to serve the University at the present time as Interim Dean and Edith Clemmer Steinbright Professor in Gerontology. In September, the Trustees elected Leslie Laird Kruhly, B.A., M.A., to the senior administrative position of Secretary of the University. Prior to accepting this appointment, Ms. Kruhly was Associate Director of Development and Special Events for the University of Pennsylvania Museum of Archaeology and Anthropology. She had previously held a series of increasingly responsible positions at National Association for Advancement in the Arts, culminating in the position of Ethexecutive Vice President for External Affairs. She is the seventh woman to serve as Secretary of the University and the fifteenth woman to serve as a Statutory Officer of the University. Ms. Kruhly continues in the position of Secretary of the University at the present time. In October, the General Alumni Society elected Sylvia Marie Miller Rhone (B.S. in Econ., 1974), Chairman and CEO of Elektra Entertainment Group, to a five-year term as an Alumni Trustee. Her term began in January 2001 and will conclude in December 2005. She was the seventeenth woman to be elected an Alumni Trustee and she continues to the serve the University as an Alumni Trustee at the present time. On January 27, 2004, Trustee Chair James Riepe announced the selection of Dr. Amy Gutmann, then Provost of Princeton University, as the eighth President and Chief Executive of the University of Pennsylvania; the University Trustees formally approved her appointment at their February 20th meeting. When Dr. Gutmann took office on July 1, 2004, she became the second woman president of the University of Pennsylvania. Official inauguration ceremonies took place on October 15, 2004.